Who doesn't love french fries? People love french fries all over the world. In fact, frozen french fries top the list of exported U.S. potato products, they account for more than half of the total potato export volume. In 2009 the United States exported 3 billion pounds of frozen french fries (USDA). French fries have a special place in our collective hearts and arteries, whether it's a burger with fries or fish and chips, fried potatoes are not going anywhere. With all due respect to the fried potato, it's not a completely seasonal vegetable, despite the ability to purchase in supermarkets year-round, potatoes are generally considered an autumn crop in most regions of the United States. Using seasonal ingredients and engaging cherished food traditions can go hand in hand with a little bit of creativity, and by following my theory of frying starchy vegetables you may adapt or expound upon the recipe in this article. 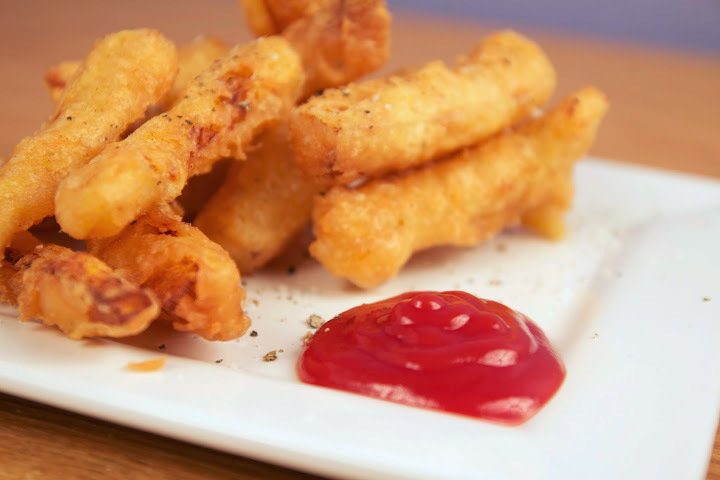 This simple theory is starchy vegetable + beer batter + deep frier = good stuff. Nature loves variation and so do I, so changing the vegetable and therefore recipe for fries depending on season only makes sense. The current season is winter, and hearty winter squash are wonderful for sustenance throughout the winter. This is partially because winter squash can be kept inside the home at room temperature for months if properly hardened during harvest. I personally believe winter squash, which includes the popular pumpkin, butternut squash, and of course delicata should be kept in everyone's home during this season of scarcity. To better explain how winter squash last so long I will chemically compare them with their close cousins, summer squash which include zucchini and pan squash. 90% of winter squash's calories come from carbohydrates and 50% of those carbohydrates are starch(TWHF), this starch sustains the winter squash for a duration of months due to the slow conversion of starch to sugar over time. Summer squashes do not have the same lifespan as winter squash because their energy source is largely composed of the carbohydrate glucose, this is also known as the sugar in ones blood sugar. Vegetables which keep stores of energy for long periods of time like winter squash or tubers such as potatoes slow release energy due to their starchy composition and low water composition are the ideal candidates for seasonal frying. Besides being a good source of starchy energy, winter squash are full of vitamin A, and a good source of vitamin C and fiber (TWHF). In fact using Nutritiondata.self.com to compare overall nutrition with potatoes, winter squash are both more filling and more nutritious. Delicata squash have a delicious and semi-sweet squash taste. When covered in the beer batter and fried, the squash melts in your mouth. It's not a potato, and I promise you that is a good thing. Feel free to try with different winter squash varieties such as pumpkin or kabocha for slight variants on taste. Combine 1 cup of flour, egg, old bay spice, and bottle of beer and whisk until combined. Slice off the skin of the squash. Scrape out the interior of the seeds, reserve for other use. Slice the squash into a thick julienne, I prefer them larger. Dredge the squash slices in enough all purpose flour to coat. Drop the dredged slices into the prepared beer batter. 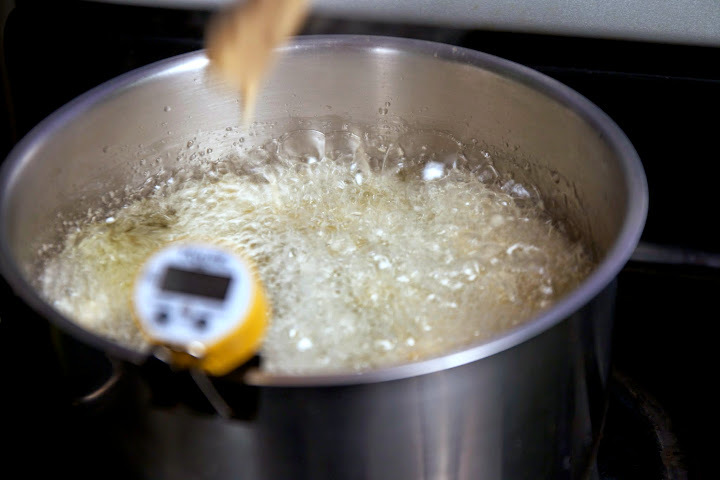 Carefully drop the battered fries into a pot of oil at 375 F until they float to the top. Roughly 3-5 minutes. Remove from oil and quickly absorb excess oil with a paper towel. Bond, Jennifer K. "Potatoes." United States Department of Agriculture Agricultural Research Service. USDA, 7 Oct. 2014. Web. 3 Feb. 2015. <http://www.ers.usda.gov/topics/crops/vegetables-pulses/potatoes.aspx#trade>. Carrera, Amy L. "Carbohydrates in Zucchini." Livestrong.com. N.p., 28 Jan. 2015. Web. 3 Feb. 2015. <http://www.livestrong.com/article/459868-carbohydrates-in-zucchini/ >. "Squash, Winter." The Word's Heathiest Food. The George Mateljan Foundation, n.d. Web. 3 Feb. 2015. <http://www.whfoods.com/genpage.php?tname=foodspice&dbid=63 >.